The following is a recap of the decisions from the 2011 World Council Meeting. For the official wording of the decisions and directives of the World Council, please see the 2011 WCM Minutes available for viewing here. - Jim Farmer (USA) was elected Chairman and Robin Eagleson (IRL) was elected Vice Chairman. Additional members of the IJCA Executive Committee for 2011 are: Paul Scalisi (USA), Marianne Schoke (SWE) and Siegfried Spitzky (ARG). - Tim Winger (USA) was elected Chairman of the International Technical Committee. - Class Rule 3.8 was modified to deal only with “Fixed Fittings” to be carried when racing. This is a wording change and does not alter the way the boat is provisioned or sailed. - Class Rule 4 was modified to remove the word “safety” from the title. This is a wording change and does not alter the way the boat is provisioned or sailed. - Class Rule 3.7.3 was changed to reduce the “all-up weight for racing” to 1330 kg from the current 1345 kg. This will require changes to all boats’ Optional Equipment lists to meet the new lower weight but will not require re-measurement or issuance of new measurement certificates. - Class Rule 8.1.5 was deleted as it is redundant to the RRS. - A proposal to allow a wire strap between the mast bearing beam and the underside of the deck was approved in principle. The final wording of the rule change will be developed by the International Technical Committee and ratified by the World Council before inclusion in the Class Rules. - Each NJCA will be required to carry out a program of scanning all J/24s for illegal materials during the calendar year 2011. The details of the procedure and tools to be used will be distributed by the IJCA in the first quarter of 2011. 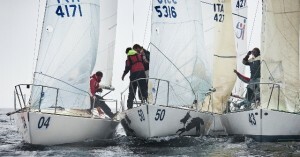 - The 2013 World Championship will be held at the Howth Yacht Club in Howth, Ireland. Anticipated dates are September 14-21, 2013. 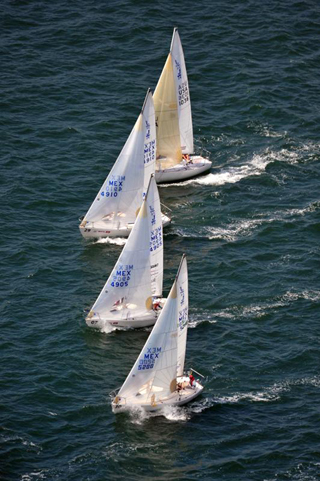 - The 2014 World Championship will be held in Newport, Rhode Island, USA. The anticipated dates are September 20-26, 2014. 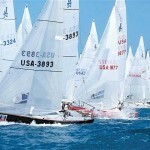 - The 2012 European Championship will be held at the Club Nautico Arzachena in Sardinia, Italy. The expected dates will be in May or June of 2012. - The 2013 European Championship will be held in at the Monaco Yacht Club. Exact dates will be forthcoming. - Entry to the 2012 World Championship in Rochester, New York, USA will be open to all members in good standing of the International J/24 Class. 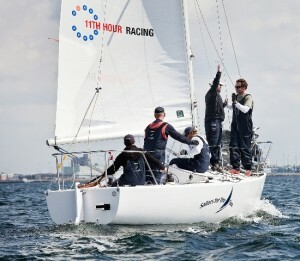 All helmspersons will also be required to have been members of the J/24 Class in 2011 and to have helmed in at least one class sanctioned event in the calendar year 2011. - To deal with the inequities of the current system, the World Council approved a motion to require that all royalty labels be purchased directly from the IJCA office on a retail basis. This discontinues the current system of wholesaling royalty labels to NJCAs. - An updated and redesigned website is in process and the new site will go live to the internet in the near future. - A 2011 class magazine will be produced and distributed to all the paid NJCAs in the first quarter of 2011. Tim Healy is the new champion of the J24 class 2010. This crew mastered the various conditions in Malmo and won convincing. Ian Southworth (GBR) sailed good at the end for the silver medal and Andrea Casale took the bronze. Best Swedish boat was Per-Håkan Persson finishing eight. It has been an honour and pleasure for Malmö Segel Sällskap to arrange J24 Worlds 2010. During the first days of registration and measurement the rain poured down and thunder and lightning crossed the skies for hours and nights. Bob Turner’s speach at the wonderful Opening Dinner at Malmö Town Hall started with a pray that the ancient Thor – God of Thunder - and his hammer would keep quiet the rest of the competition. Thor listned to Bob and understood his message. The weather improved day by day. The winds were strong until the last and 5th day racing - when the warmth of the sun embraced the sailors and light winds hit the course. The courses laid close to the harbour. It was OK for spectators the follow the races from the West Habour pier. The water is called Malmö Sailing Arena. What MSS has learned is that the J24 people from all over the world are fantastic. They have sailed each race without complaining. They are all heroes and winners. Class members will have already noted the timing and location of the WCM to be held in Jacksonville Florida on November 19th. To ensure the best preparation, please note the following timelines. Class members will have already noted the timing and location of the WCM to be held in Jacksonville Florida on November 19th. To ensure the best preparation, please note the following time lines. Here is a cool video of J/24 racing from Holland. Enjoy! Dennis passed away at the age of 92 on Wednesday, 1st September with his wife Marion beside him. His health had been deteriorating for the past few years although he was determined to keep going and his mind had remained as alert as ever. Many may not be aware that Dennis joined the Class Technical Committee on its foundation in the early 1980s, under the Chairmanship of Rod Johnstone. He was the main instigator of most of our current long-standing International Class Rules, working closely with the then IYRU (now ISAF). In the early 1990s, Dennis took over the ITC chair from Rod, a position that he held until his retirement from the ITC in 1997. This did not end his association with the Class, as he was made a Councilor of Honor and remained a technical advisor to the J/24 Class in the UK right up to the end. Dennis will be truly missed by many J/24 stalwarts. His knowledge of Class history was huge and his stories of the earlier years quite fascinating. Funeral services were held at Holy Trinity Church, Cowes, England at 12 noon on Friday, 10th September 2010 followed by a wake held at the Island Sailing Club. 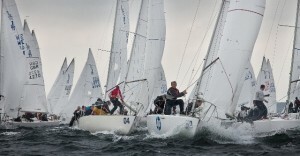 J/24 Worlds in Malmö Sweden: What goes up must come down? This is true for wind direction but as far not for Tim Healey. In 1983 when the J/24 Worlds was hosted by Malmö Segel Sällskap - Ed Baird was the winner. Nice rolemodel for the leader this time. He sailed outstanding being able not only to stay inside top ten all the races but also sail to win races. Two things that not always go together. For the last day he (now just has to withstand the prophecy and) has a solid lead and it seem like Tim must have the directing signs the others are seeking on the course. Ian Southworth slowly working his way up is second with one day to go! Excellent weatherconditions today. Medium breeze, sunny and no rain. Tomorrow light winds approx 5 m/sec. Three days into the championship T Healey(USA) leads followed by Tony Parker (USA) and Andrea Casale (ITA). Healey took over the lead yesterday when he was freed from an early start and extended it today with one more win and a second place in race six. Southworth (GBR) and Karsunke (GER) are following. The weatherforecast is finally promising better weather, still good wind is expected but from tomorrow without rain. The race officer Peter Reggio has been kept busy from shifts and gusts. Worst possible touristic conditions but perfect sailing on the second day of J/24 in Malmoe. Light and tricky winds in the first race was followed by broaches and breakage in the second, both races in heavy rain. Even starts and tight roundings challenges crew work and nerves for the participants. In the first race of today A Gunnarsson (SWE) sailed in the lead from the end of the first upwind and won elegant the first race. M Garzmann (GER) advanced to second from a nice last upwind in the light and shifty breeze. 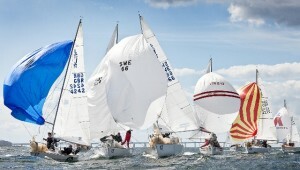 In the second race the wind increased to 12 m/s. M Santa Cruz (BRA) made a false start and have had a poor beginning of the worlds. T Healy (USA) won the fourth race before PH Persson (SWE), who had a nice start and sailed with good height and speed on the upwinds. Third was previous champion A Casale (ITA). After four races Casale is leading Pereira (ARG) and Karsunke (GER). Ingham (USA), Gunnarsson (SWE) and Southworth (GBR) follows in the battle for the title. The races are visible from the shore close to the Turning Torso building starting 10.30 every day. 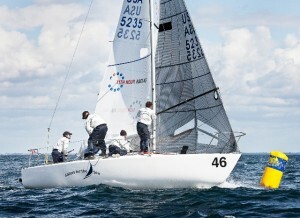 Strong offshore winds disturbed the sailors during the two first races of the Worlds in J24. Some of them broached and capsized an further sailors expirienced broken equipment causing them disappointing results. Matias Pereira from Argentine sailed up to a nice lead ahead of Tim Healy, US and Stefan Karsunke from Germany. The former champion Andrea Casale from Italy is in forth place followed by Ian Southworth from Great Britain. The most successful sailor and champion of the class Mauricio Santa Cruz from Brazil struggled on the first day and is well behind at number 15. The swedish boats is still in good position with PH Persson in 10th and A Gunnarsson in 11th place with results that could be counted in a top score series if they improve a litte and avoid mistakes the following days. Harken has recently made changes their winch product line. They have discontinued the 32B that has been one of the mainstays of the winches used as primaries, and replaced it in their product line with the Radial 35.2 PTA . Also the model 16 that has been a common secondary winch for the class has been replaced by the model 20. Both the 32B and 16 are no longer in production and there is very limited to no availability of either winch. 1. The Harken Radial 35.2 PTA winch which has a drum diameter of 79.4 mm. The existing class rule accommodates the 32.2 winch 75 mm drum diameter but not the 35.2. 2. The Harken model 20 winch which has a drum diameter of 73.4 mm. The existing class rule accommodates the 16 winch 70 mm drum diameter but not the 73.4 mm of the model 20. The following amendments to the Class Rules have been approved to be effective 16th July 2010 by the Class Rules Sub Committee. Class Rule 3.8.3 (Fixed fittings and equipment to be carried when racing) Amendment. Two primary sheet winches positioned on deck between the mainsheet traveller and the aft face of the forward end of the cockpit well with a drum diameter not exceeding 80mm. Two secondary winches with a drum diameter not exceeding 74 mm. These may be used to sheet the tails of all running rigging. Congratulations to Mauricio Santa Cruz and his team on Bruschetta from Brasil FIRST PLACE. Fourth to Jorge Javier Murrieta on Vive México. First Mexican. Leif Tom Loose on Rotoman, 6th. Germany. It was worth it to came from so far away. Fraito Lugo on Peligroso, 8th. Puerto Rico. Yon Belausteguigoitia, on Chimera from México, 10th. Six different nationalities for the first 10th places. Congratulations to all and to all the fleet that competed with all they could and lots of enthusiasm. Everything has an end. Thanks to our Presidente de México, Felipe Calderón who had the original idea to make this Regata Copa México Bicentenario, and made it possible. El Secretario de Turismo, Rodolfo Elizondo, Miguel Gomez Mont from Fonatur, Almirante Mariano Saynez Mendoza, Secretario de Marina, El Gobernador del Estado de Nayarit, Ney González. The Regatta authorities Ernesto Amtmann, Chairman Regatta Copa México, Peter Wiegandt, Vice-Chairman, Kenneth Porter. The team that made this regatta possible, judges, assistances, Marina Armada de México, organization, etc, etc. Our J-24 friends that came from so many different countries to enjoy this festival with the Mexican fleet. Very good competition. We hope all of you had fun. Remember to tell your family, your friends that they are welcome to México. Hope to see you racing sometime somewhere.